Parley for the Ocean and adidas continues to expand on their partnership with yet another new take on the Ultra Boost Uncaged. Constructed fully with plastic recycled materials. This adidas Ultra Boost Uncaged comes dressed in the signature Parley color tones. 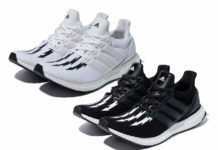 A full-length White Boost midsole, Black heel tab with Parley branding atop matching White rubber outsole completes the design.